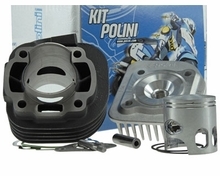 There are plenty of Polini fans out there that swear by the 70cc Sport kits for everyday street use. Equal to the Malossi Sport Kit, so keep in mind an exhaust upgrade plus air and fuel is always suggested, this kit includes air filter nd main jets. Maybe its the high torque with massive bottom end punch that makes the kit P166.0076 from Polini so very reliable. For a street kit you can not go wrong. Cast iron with two ring piston makes it the perfect everyday get off the line at the light and stay out front. 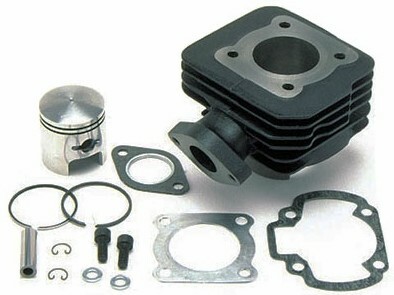 Main jet and pilot jet plus a performance air filter are included so you my keep stock carb and stock exhaust. We also suggest that your roller weights be 5gram and belt in good condition. 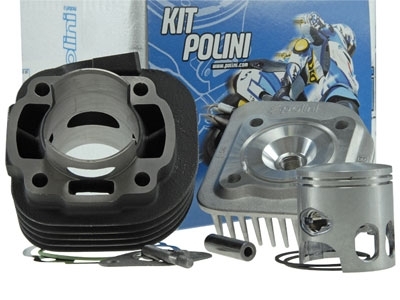 The Polini kit will add overall performance so your CVT needs to be in top shape to take advantage of new found power. For top results we suggest a carb and exhaust upgrade as well as Dr Pulley Sliders, Torque spring plus quaity belt. From there continue with variator clutch and clutch bell.